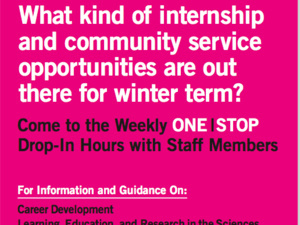 Come to the weekly One Stop Drop-In Hours with staff members to get information and guidance on winter term. What are my options for winter term? What kind of internship and community service opportunities are out there for Winter Term? How can I get funding to do research or any other project over winter term? Talk through these questions and more. Drop in on your own or with a friend for personalized, face-to-face meetings with staff members from the Academic Advising Resource Center; Bonner Center for Service and Learning; Career Development Center;Center for Learning, Education, and Research in the Sciences; Fellowships and Awards; Multicultural Resource Center; Office of Study Away; Office of Winter Term; International Students Resource Center; and Office of Undergraduate Research.